President Julia called our weekly Rotary Club of Austin (RCA) meeting to order right at noon. Diane Ventresca led the pledges, Jack Wolfe gave our invocation of the day and Paul Daley led us in saying the Four Way Test. Chris Forrest greeted each member and guest as they arrived, and Carl Noble introduced our many guests and visitors. President Julia introduced our newest member Chad Thompson, sponsored by Jill Johnson and Carl Noble. Congratulations Chad, and welcome to the Club! Scott Rider then provided the Membership Minute and shared with us a little bit about his journey with Rotary that began 46 years ago when his father took him to his first Rotary Club meeting in Ennis, Texas. Since that time Scott has served in the automotive oil change business and has a construction company here in Austin. He enjoys Rotary very much, too! Jon Yates announced that the Librarian at Pecan Springs Elementary School needs some help shelving books! Volunteer hours are extremely flexible on Mondays or Fridays, between 7:30 and 2:30. Ann Marie Ellis also reminded us about the Rise Against Hunger Event coming up on February 23rd. Volunteers are definitely still needed to help out! Remember to sign up for the weekly meeting on Meetup.com and Facebook. Thank you for the extremely generous $2,050 collected last week on behalf of furloughed FBI workers in Diane Ventresca’s and Karen Collins’ local office. The funds were used to purchase 41 HEB cards of $50 each that were distributed to workers in need. A card for Bruce Golden is circulating as he may need surgery for his back. Both Jack Mayo and Past President Bill Gaston passed away this week. A service for Bill will take place at 3:00 on Saturday at the Good Shepherd Episcopal Church. Meanwhile, we’ll let you know about plans for Jack’s memorial service once they become available. Please keep their families in your thoughts and prayers. After several minutes of Fellowship time, Richard Payton thanked the many volunteers who interviewed prospective students and participated over the weekend at Camp Enterprise. 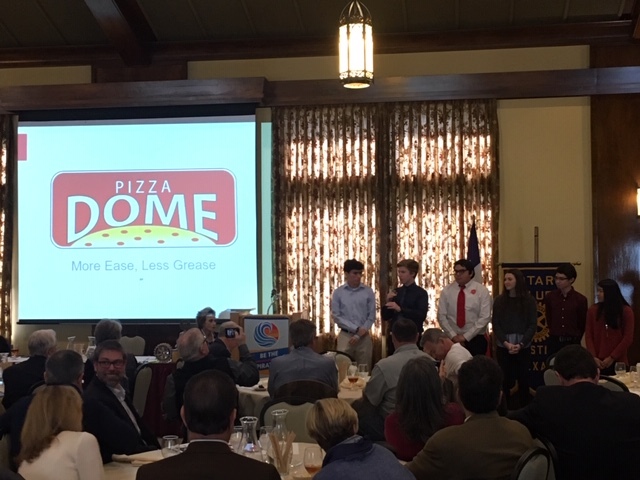 The six winning team students (Augie Danze, Dylan Holbrook, Jack Finnegan, John Munoz, McCall Moore and Ming Thomas) presented their idea for a “Pizza Dome” stone designed to drain grease away from pizza while it cooks. The “More Ease, Less Grease” product will retail for $39.95 with the expectation of over $1.5 million in annual sales after 3 years. Given that almost everybody loves pizza, there were many questions from the audience about whether the product may actually come to fruition. The team received much support and encouragement from the Club, including a promise of an “angel investment” from RCA member Tarby Bryant! Great job and best of success to you all! President Julia then thanked two of our newsletter advertisers Mark Johnson with IBC Bank and Mike O’Krent with LifeStories Alive. Thank you both! Next week our speaker will be Robby Riggs from Rise Against Hunger.